On July 11-21, 2019, Triumph TRs will get a unique chance to join the fun on the TR Register Liège-Brescia-Liège Rally. and in September 2020 we will take microcars to the Pyrenees! If you would like more information on any of these events, or if you would like YOUR marque to be chosen for future years, let us know: Click here to email us for more info. Please note we now have a FACEBOOK page, and are on Instagram: see you there! JULY 11-22, 2018: the Microcars rolled once more! For the Diamond Jubilee of the original Liège-Brescia-Liège we went back to our roots with the ultimate rally for microcars. If you would like to compete in a microcar event like this, email us now! JULY 11-21, 2019: it's the turn of the TRs! For the 61st year of Liège-Brescia-Liège we invite a range of cars with a fantastic history of international competition - the rugged, reliable, fast and fun Triumph TR range, from TR2 to TR8. We enjoyed the full route recce in July 2017 in our own TR3, and realised what a fabulous experience the rally could be for all TRs. These cars were heroes on the best-known Liège events of the 1950s and 1960s - those events were far too long and gruelling to recreate now, but Liège-Brescia-Liège is an authentic 1950s rally route from the same organisers, taking in all the best bits of their bigger events, that is ideal for today's enthusiast because you can drive the entire route back to the historic Liège starting point in 9-10 days. For the TRs, there will be 9 days of driving, plus a day off in Ljubljana. Now's your chance to compete against fellow TR owners, on historic rally routes in stunning Alpine scenery, with fascinating visits and great hotels along the way. This is a unique opportunity, the only rally ever run exclusively for Triumph TRs! In July 1958, 54 pioneers in 27 tiny cars set out from Liège in Belgium in a brave attempt to prove that the new breed of tiny-engined cars, made popular by the Suez crisis two years earlier, were not just toys but could do everything their bigger sisters could do – and much more economically. The schedule was staggering. 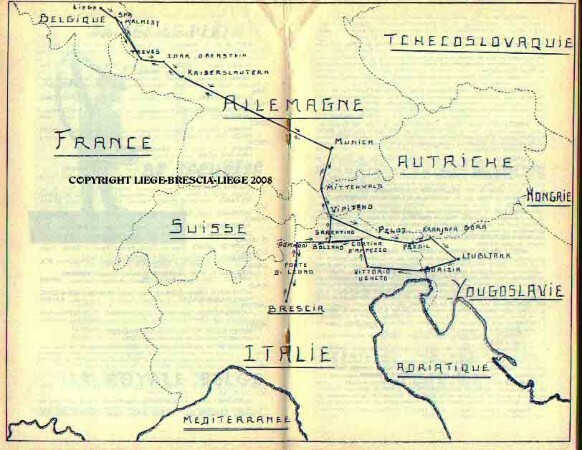 Cars would leave Belgium on Thursday evening, travel all night through Germany, cross the Alps via Austria then head east through the Dolomites into Yugoslavia, tackling many notorious loose-surfaced mountain passes on the way. Still without stopping except for fuel and snatched refreshment, they would turn around at Ljubljana and return through the Dolomites to tackle Europe’s most challenging mountain pass, the Stelvio, descending south to Brescia. This was no easy cruise - torrential rain through Belgium, Germany, Austria, Italy and Slovenia added to the strain on the first four days, but crews and cars rose to the challenge. The sun finally joined us in Ljubljana and stayed with us to the end of the rally. Cars that could have been eligible for the original event competed in 250/350/425/500cc classes in the Authentic category; slightly later and larger engined cars competed in 425/500/600/700cc classes in the Spirit category. See the LBL08 page for full results and more photos. For 2019, it will be the turn of the Triumphs. We will stay at the very best hotels along the route. 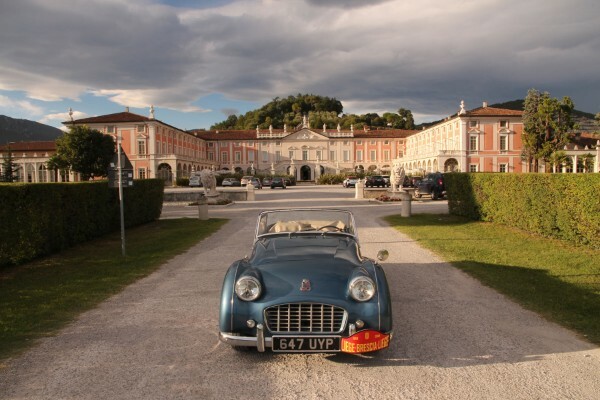 In Brescia, we will stay in the spectacular Villa Fenaroli Palace (below) - we believe that classic car rallying should be challenging, but there is no need for roughing it: at the end of a hard day's driving, navigating and sight-seeing, we want to see you relax and enjoy yourselves! See the Links page for all the hotels we use, and some we have used in the past.